The boys find trouble in Vegas and New York this week! Up first, The Rabbit Who Ate Las Vegas, which was written by Frank Lupo and aired on 1 March, 1983. 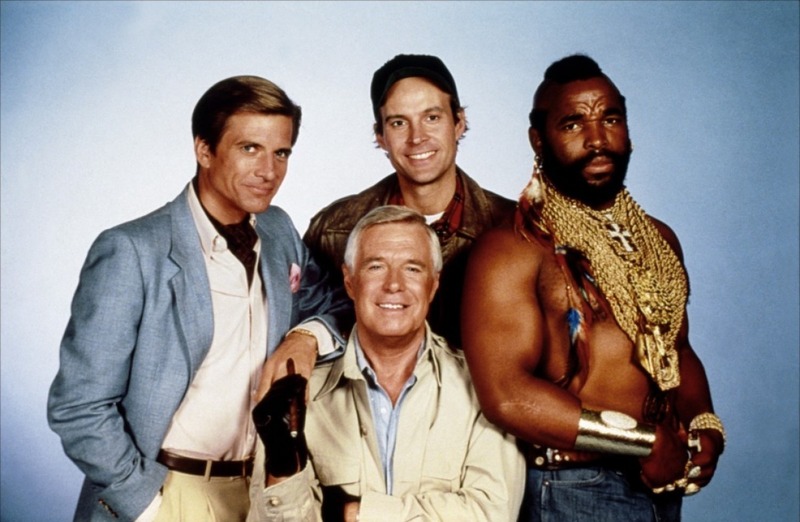 The A-Team is approached by two college students, Sue Beth (Michelle Avonne) and Darlene (Katherine Moffat) who want to hire them to rescue their professor, Bruce Warfel (Terence McGovern) who went to Vegas to test his system, which works, and consequently, got him grabbed by the mob. 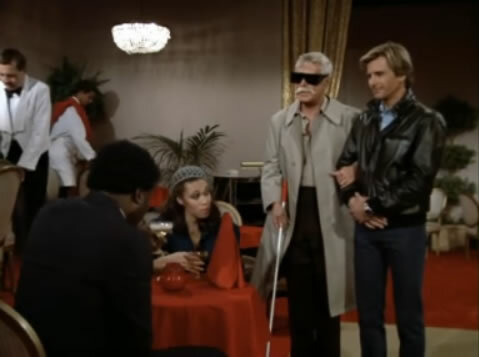 Hannibal (George Peppard) rolls into town posing as mobster Tony Vincent, with Amy (Melinda Culea) as his moll, Murdock (Dwight Schultz) as his aide, and B.A. (Mr. T) as his muscle. They then run a con on the local mobster, Gianni’s (Charles Cioffi), girl, Elly (Tracy Scoggins) about actually being an agency hit team, hear to take out Gianni. They also make sure their phone calls are tapped, when they report in to Face (Dirk Benedict) who is pretending to be their Agency control. They set up a deal for Warfel, but as they are leaving, someone kills Gianni, and the team seems to be the only real group of suspects. So they decide to take the fight right to the new head, and actual murderer, Martell (Richard Romanus). This involves a rather embarrassing sequence featuring Hannibal in black face (gah!). What follows those is an all out car chase as the mob tries to hunt down the team, and kill them. But it actually allows the boys to reveal the real killer and get away with Warfel. In The Out-of-Towners, written by Lupo and airing on 15 March, 1983, the Team is off to New York. Face is already on site, doing some scavenging and scrounging, while Hannibal and Murdock convince (mostly) B.A. to fly commercial. They are heading cross country to help a group of shopkeepers who are being extorted by local crime boss, Charles F. Struthers (Yaphet Kotto). Hannibal takes on the role of a blind man who opens a small TV repair shop in the neighborhood, and wait for the thugs to show up and make their move. While Hannibal does that, Face continues to scrounge, Amy is on research, B.A. drives a (DC) cab and Murdock is the center of affection, much to Face’s dismay, when local girl, Tracy (Wendy Hoffman) falls for the eccentric pilot. Hannibal gets to spout his iconic line, as they literally trash Struthers’ restaurant. They then have to prepare the neighborhood for war as the criminals react furiously and violently. Bullets are everywhere, causing lots of property damage, but no human fatalities; even when Molotov cocktails start getting thrown around! And surprisingly, with all this gunfire and noise, not a single cop shows up! What I really liked was the implication that after a mission is taken, Face is first on the ground, doing scouting, set-up and making contacts. And I’m sorry, I have a hard time believing that B.A. could have been put on a commercial flight in a state of unconsciousness, though the flight attendant gag they pull on him is rather funny.